Evan writes about FPSes each week in Triggernometry, a mixture of tips, design criticism, and a celebration of virtual marksmanship. 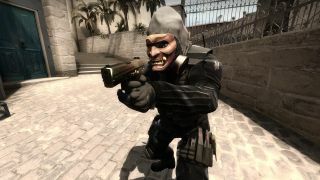 CS:GO is, in plenty of ways, a game about playing with your opponent's expectations. How long it takes players to reach a key chokepoint from their spawn is a fixed variable—running at full speed, it's impossible for Terrorists to beat the CTs to bombsite B on Mirage, for example. Those expectations form the basis for your tactics as a team and the decisions you make. But there are some clever ways to play with them, to use your opponent's expectations and assumptions against them. And what better time to do so than on an eco round, when your team has very little to lose? The highlight above was a lucky eco round we pulled out by playing a little unconventionally. The round was actually a turning point for our team: we started the game down 0-6, and went on to win.